Now the best-selling The Original MantleClip® stocking holders can be personalized with these decorative clip-on plastic chalkboards. 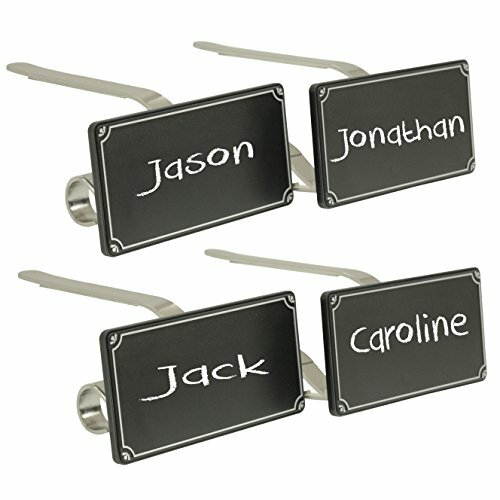 Each pack comes with 4 SILVER metal MantleClipTM stocking holders, 4 clip-on plastic chalkboards and chalk. The chalkboards clip easily onto the front of the included Original MantleClip® stocking holders, adding a festive and fun look. Hang your stockings safely and securely with The Original MantleClip® stocking holders. These holders are lightweight yet can hold a full stocking without falling off the mantle, making them more kid friendly, compared to heavy, counter-balance stocking holders. The MantleClipTM stocking holder is specifically designed to not only hold stockings, but also lights, garland and other decorations. Adjustable to fit most mantles, up to 3 inches thick. Protective pads prevent scratches. The Original MantleClip® extends up to 3 inches to fit most mantels. If you have any questions about this product by The Original MantleClip, contact us by completing and submitting the form below. If you are looking for a specif part number, please include it with your message.